Since this email the election has taken place and many observers say it’s the fairest election in recent history. But, things are not quiet now. The Washington Post reported Wednesday from ABUJA, Nigeria — Violent protests broke out across Nigeria. Protests, church burnings and evictions of non-indigenous Christian populations swept across several northern states, notably Kaduna, Katsina, Jigawa and Kano region following an election victory by incumbent President Goodluck Jonathan, a Christian. While young men initially protested against the election and caused minor disturbances, later the crowds grew into the thousands. Across the state, mobs engineered two prison breaks, burned down the home of one powerful traditional ruler and attempted to destroy the home of Nigeria’s Vice-President. “They almost overwhelmed us,” Johnathan said. International news organizations say authorities and aid groups are hesitateing to release nationwide tolls of the deaths and injuries after the riots for fear of inciting reprisal attacks. But authorities in Bauchi state said 16 people had been killed in the violence. Officers recovered 31 corpses from Kaduna alone. Police arrested more than 300 people during the rioting. Meanwhile, a theater review notes that a one-act play in San Francisco is stunning in its pathos, as well as its comedy. The reviewer said it’s a brilliant example of how universal the personal can be. In Massachusetts, the morning news reports that a man used his fake leg to take down an armed robber. 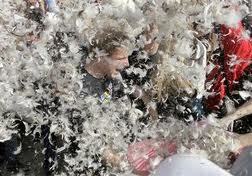 Feathers flew as Sacramento celebrated International Pillow-Fight Day at Fremont Park. No word on the global cleanup costs. ﻿﻿﻿﻿﻿﻿﻿﻿﻿﻿﻿Meanwhile police detectives alleged one of my neighbors grabbed an ax and chased an innocent kid, stranded by his disabled car, a quarter-mile down the street before killing him in a field. They arrested the man on suspicion of murder later that day. The battery in my car is getting weak, which means I’d better get a new one before I get stranded in my own neighborhood. Meanwhile, the Associated Press tells us that because there’s yet no permanent storage facility for spent nuclear fuel in America, this very hazardous material is kept near the reactors that generated it. According to a new AP investigation, the nation now maintains nearly 72,000 tons of nuclear waste. And this amount is growing by about 2,200 tons every year. Meanwhile, Massachusetts Institute of Technology professor Ernest Moniz called for an accelerated transfer of spent nuclear fuel rods from storage in water-covered pools at reactor sites to concrete and steel ‘dry’ casks. Moniz said the federal government should create several regional facilities to store the containers for an extended period until a new strategy for managing nuclear waste fuel can be put in place—a position he and MIT colleagues have argued for since before the emergency at Japan’s Fukushima Daiichi nuclear complex. The problem is no one wants spent nuclear fuel in their neighborhood. Meanwhile, California would vastly increase its commitment to wind, solar, geothermal and other renewable energy under legislation signed by Gov. Jerry Brown, affectionately called “Governor Moonbeam.” The measure would require public and private utilities to obtain 33 percent of their electricity from renewable energy sources by 2020, a sizable increase over the 20 percent required now. Meanwhile, Reuters reports that U.S. farmers say they will plant some of the biggest corn and soybean crops ever this spring, racing to keep pace with unrelenting global demand that’s rapidly depleting stockpiles and driving up food costs. 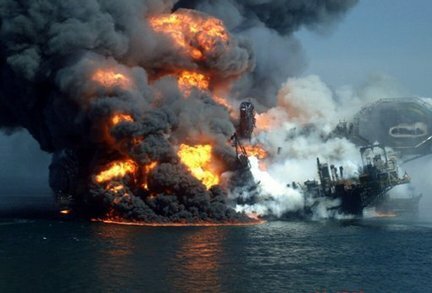 Meanwhile, in San Francisco last week, Transocean Ltd. gave its top executives bonuses for achieving the “best year in safety performance in our company’s history”—despite the explosion of its oil rig that killed 11 people and spilled 200 million gallons of oil into the Gulf of Mexico, creating one of the nation’s worst natural disasters. The safety bonus for CEO Steve Newman totaled $374,062. Meanwhile Only a quarter of Californians over the age of 50 believe they have the amount of health care coverage they need, according to a new American Association of Retired People survey. Meanwhile, Scientists have successfully introduced human genes into 300 dairy cows to produce milk with the same properties as human breast milk. Human milk contains high quantities of key nutrients that can help boost the immune system of babies and reduce infection risk. The scientists behind the research believe milk from herds of genetically modified cows could provide an alternative to human breast milk and formula milk for babies, which is often criticised as being an inferior substitute. 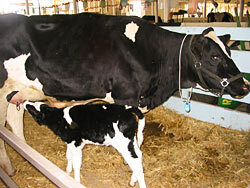 They hope genetically modified dairy products from herds of similar cows could be sold in supermarkets. The research has the backing of a major biotechnology company. Meanwhile, I haven’t yet sold my novel, but I’ve published a few poems lately. I agree with you, Richard, that great literature is a land where you’re never sure where the next turn will lead you. I sincerely hope those of us in America who enjoy fresh, provocative writing will follow your beautiful literary journal www.sentinelnigeria.org/online through its twists and turns. And, I pray for you and your family and for peace in Nigeria. Meanwhile, it’s spring in Sacramento and everything is blooming. So, Dear Richard, if you have time to take a left turn on the path to El Dorado, visit me in the Word Garden. Best wishes to you and the gifted writers of Nigeria. Thanks for your support. They gave their execs bonuses???? How completely absurd is that!! Swear the news tidbit is true — ripped from the headlines about the one-year anniversary of the disaster. I was shocked! I really like the 'simultaneous events' nature of this… and the perspectives left for judgement by the reader, as you you wish to Inform and Encourage that folks go from here by informing themselves wider than they previously might've. Thanks for sharing this. You got my intention exactly right, Anonymous. It's a “Day in the Life” pastiche intended to be thought provoking on a personal, as well as global level. I'm deeply grateful to live in America where we can think widely about things, sometimes act a little silly, and elect our representatives without violence. If I didn't say so earlier, I heard from Richard Ali and he is safe for now in Nigeria. Thanks so much for commenting.